Bank of Canada governor Mark Carney says a new age of central banking is being created out of the ruins of the recent financial crisis that, if done correctly, could help avert, mitigate, or at least better manage future economic crashes. One key lesson is that central banks have learned they need a more flexible approach to conducting monetary policy, Carney said Wednesday in a speech at the University of Alberta in Edmonton. In an example he has used before, Carney said the Bank of Canada now realizes that it may need to take an active role in preventing a housing bubble that could impact the wider economy. Effectively, that means the bank is prepared to raise interest rates if necessary to slow down borrowing. “The clear lesson is that a central bank pursuing price stability without due regard for financial stability risks achieving neither,” he told students and academics at the university. Notes of the address were released in Ottawa. The issue is particularly pertinent in Canada, where the bank’s low interest rate policy, which influences other interest rates such as those for consumer loans and mortgages, has fuelled excessive consumer debt accumulation, particularly on mortgages, and a hot housing market. Carney realizes the problem he has wrought, but defends it by saying that without such a loose-money policy the economy most likely would be much weaker and unemployment higher. He credits Ottawa with tightening mortgage rules and lending practices to discourage irresponsible borrowing, and he says it is working. Growth in household credit has fallen to about 3 percent, from 6 percent in 2011, and fixed mortgages now represent 90 percent of new issuances, compared with about 50 percent in 2011. “The bank now recognized there may be some cases when monetary policy may still have to take financial stability considerations into account. This is most obviously the case when financial imbalances affect the near-term outlook for output and inflation,” Carney said. 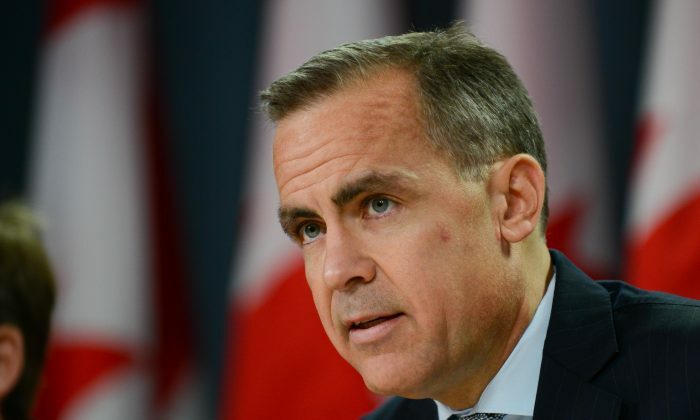 The speech, advertised as a wide-ranging lecture on the conduct of monetary policy, was one of Carney’s last major addresses in Canada before departing for the Bank of England next month. While mostly scholarly in its approach, the speech will undoubtedly be closely read by policymakers in England for clues on how their star catch is likely to conduct himself when he takes over the Bank of England on July 1. Carney is clearly advocating that central banks in the future be much more involved in financial stability issues and the real economy, although their prime concern should remain maintaining stable and predictable price inflation. For instance, he said researchers at the Bank of Canada and other central banks are in the process of trying to determine what they could have done better to prevent the crisis in the first place, and the effectiveness of the measures they have taken to mitigate the fall-out on the real economy. One of the lessons he believed should be taken from the 2008-09 recession is that central banks did little to avert the crisis from happening or even appreciate its seriousness. While they sprang into action once the bottom fell, they did not appreciate that they could have tightened policy earlier to limit the damage. One thing that appears clear, he said, is that a conventional policy of strictly targeting a set inflation marker such as 2 percent is not adequate in all circumstances, particularly during exceptional economic times. The success of the policy itself might have exacerbated the 2008-09 financial crisis by instilling a false sense of security among market players and consumers that led to greater risk-taking. As well, he said central bankers have learned to use forward guidance, that is, conditional pledges about policy direction, along with a longer horizon for achieving its inflation target, to try to influence how people borrow and spend. But Carney said there are limits to flexibility in conducting monetary policy. He said if markets lost trust in central banks, their effectiveness will be greatly diminished.